Librarians are delighted to share that we’re continuing with New York Times Online! Returning users need to reaffirm your logon for this new year’s access. New or returning users – activate your logon today – for free. Enter Grand Rapids Community College in the [Find school] field. Click [GO] and then click [Create Account] using your GRCC email address and a password of your choice. Follow the screen prompts to activate your Group Pass. Mobile users may download FREE New York Times Apps. After your Group Pass has been activated, you may enjoy access to NYTimes.com from any internet-connected network or location. NYT provides teacher resources, including: How to Use the Site and New York Times inEDUCATION. For more on New York Times Online, see our NYT Subject Guide! New York Times – for Students! 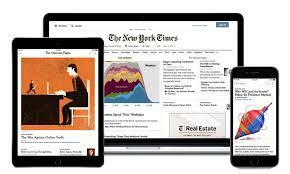 GRCC students have complimentary access to New York Times Online through your GRCC Library! If you signed up last year, you’ll need to reaffirm your logon for this academic year’s access. Whether you’re a returning or a new user – activate your logon today – for free! It’s a $110 value. Comments Off on New York Times – for Students! New York Times Online to Continue! This year, the Library & Learning Commons offered access to the New York Time Online on a trial basis. We’re excited to announce that the trial has been hugely successful with over 36,650 uses from August through mid-March 2018! Thanks especially go out to Heather Richards and Mike Light for requesting that we add a national newspaper to our collection – and to the entire Social Sciences Department for going in “halfsies” with us on the trial. The Library will renew this license and cover the license cost in its entirety in the future! Classroom faculty and librarians wanted a well-written and researched, real-time, full-image (including photos and cartoons) national newspaper so students could broaden their understanding of important issues, use as a source to combat “fake news,” and where readers were not constantly hitting the payroll – aka the limit on free articles. By alerting faculty to the continuance of New York Times Online now, they can plan new lessons knowing that students’ free access is ensured. Faculty can also sign up for a weekly email from New York Times in Education which recently published Over 1000 Writing Prompts for Students! If you haven’t created your FREE New York Times Online logon, go to the New York Times Subject Guide today and start reading!